Osteopathy. Originally from Yorkshire, he was keen to return together with his young family to offer them the active and outdoor lifestyle that he enjoyed growing up. 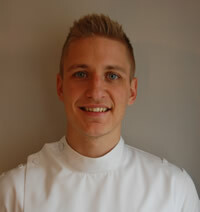 Simon incorporates a wide array of techniques within his treatments to best comply with the patients' needs and to encourage their swift recovery. His experience ranges from working with American footballers, rugby players and professional footballers. Off the track or playing field, Simon sees osteopathy being appropriate for all ages and lifestyles. He takes interest in all avenues of osteopathy from cranial and visceral treatment to structural and functional approaches, intently listening and utilising a wealth of knowledge to aid the swift recovery of the patients he treats. His structural and holistic style caters for any type of musculoskeletal dysfunction, be it related to work, sport or old age. When he’s not working, Simon enjoys hiking, rock climbing and running after his two children. He’s also active in his local community with outreach and charity work.